Go Rangers, go! 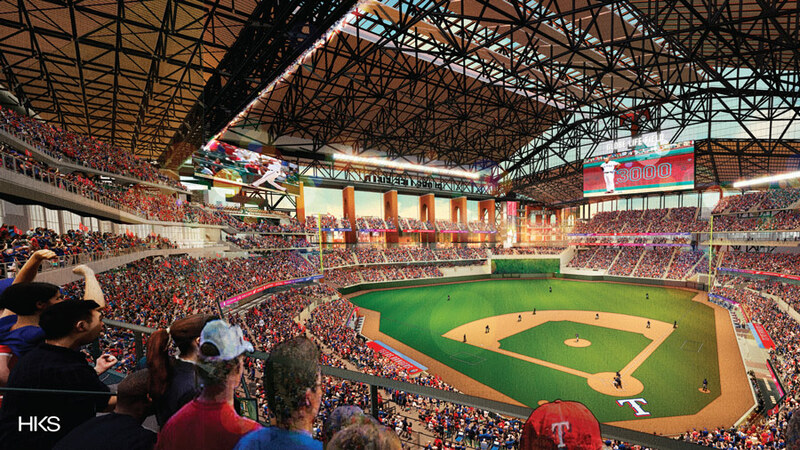 HKS has released renderings for its new Texas Rangers stadium as well as a design update for the new complex, dubbed the Globe Life Field. 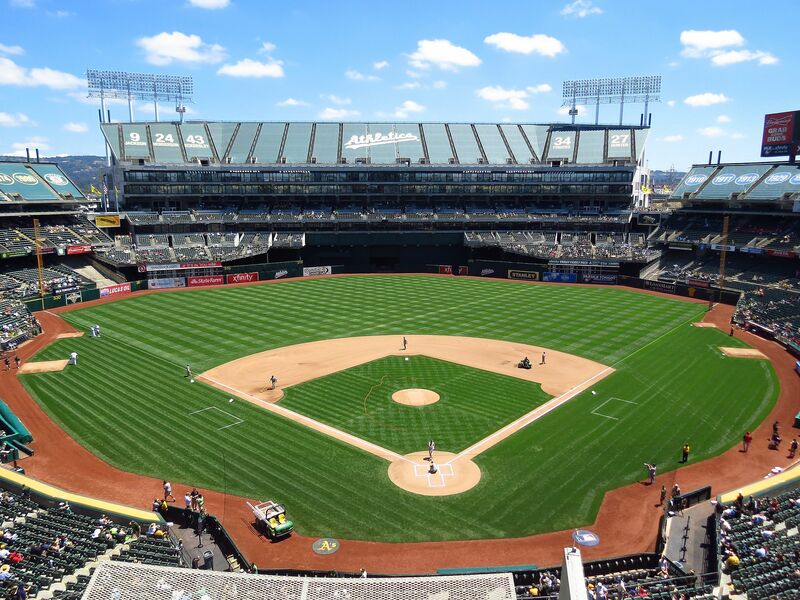 The seats at the 1.7-million-square-foot baseball stadium are closer to the field and lower than traditional stadium seating to bring a capacity crowd of 41,000 fans as close as possible to the action. A retractable, transparent roof can flood the field with sunlight or close up for inclement weather, but even when open, the roof's baffles and shields block players from direct sunlight. Arches along the upper concourse are turned 90 degrees to increase transparency along the thoroughfare, while the stadium entry is set off with an overhang – a nod to the traditional Texas front porch. Total cost? A cool $1.1 billion. 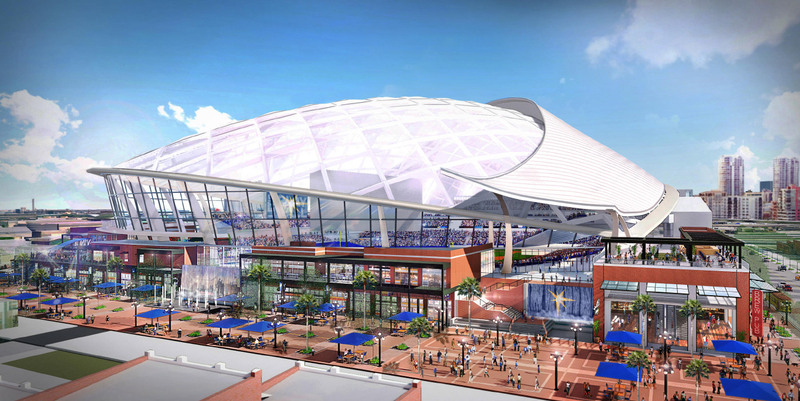 Dallas-based HKS also designed the L.A. Rams stadium, which at $2.66 billion has the somewhat dubious distinction of being the world's most expensive stadium to date. Technicians punched 20 million holes in the facade's 36,000 perforated aluminum panels, eliminating the need for an HVAC system (and driving project costs sky-high). The complex is expected to be finished by 2019. Back in Texas, the groundbreaking for the 13-acre Rangers site is scheduled for this Thursday, September 28. 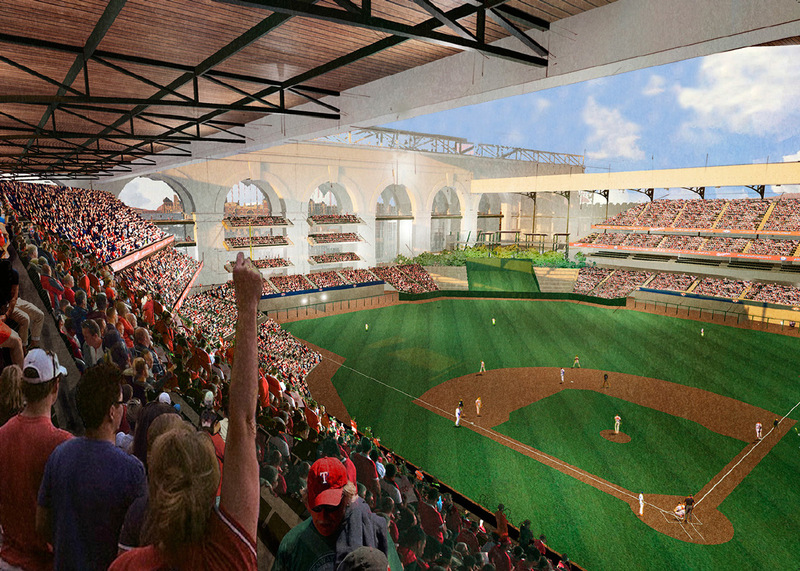 Games at the Dallas–Fort Worth-area Globe Life Field will begin in the 2020 baseball season. In recent years, Cubs baseball fans have watched as the neighborhood immediately surrounding their beloved Wrigley Field transformed into a Cubs-themed village. A new hotel, residential real estate, and entertainment venues are making the area a year-round destination. Nearest and dearest to the stadium though is a new mid-rise office building and a public plaza. 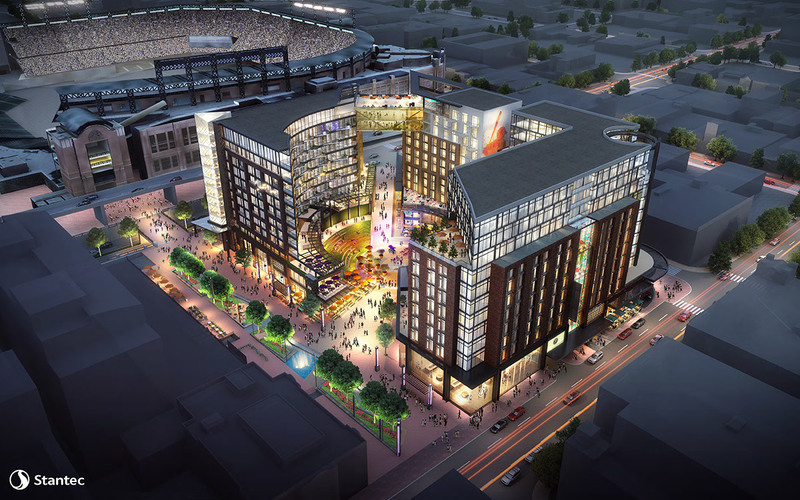 Designed by Stantec Architecture’s Chicago office, the project shares an odd-shaped block with the stadium and houses the baseball team’s administrative offices. While the space is everything you might expect of a new office (with the addition of plenty of Cubs branding and some appropriately ivy-covered walls), it is the public plaza, currently being called the Park, that is creating the most buzz. Debuted for the 2017 Cubs home opener, the Park is wedged between the stadium and the new office building. The ground floor of the office building houses a handful of stores and food and drinking options, but the plaza itself was designed to be used for more than just pregame events. 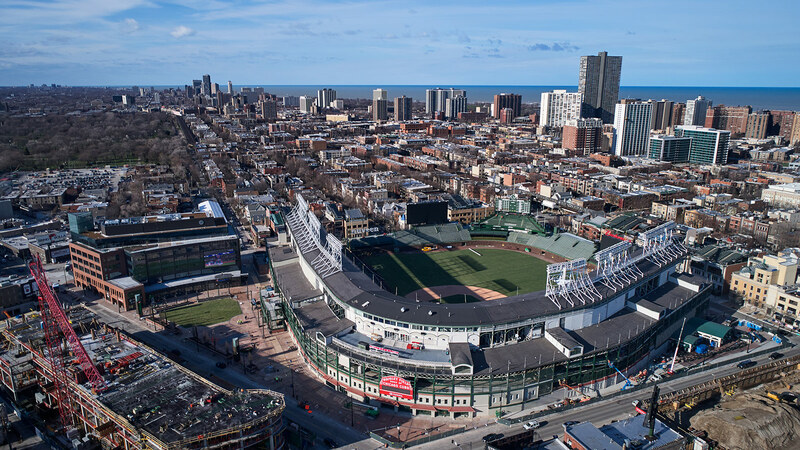 Tiered seating, strategic plantings, and performance space provide opportunities to watch scheduled programs or just take in Wrigley’s atmosphere. Stantec took cues from Place des Vosges, in Paris, and Chicago’s Millennium Park when designing the Park, with the goal of making it more than just an entrance to the stadium. In its first year, the Park has already seen plans put in place to activate the space when there is not a game being played. The Old Town School of Folk Music has started biweekly morning and afternoon music programs. The nearby art-house Music Box Theatre will also be hosting six of the city’s “Movies in the Park”—the first of which will be, appropriately, Ferris Bueller’s Day Off; Rookie of the Year and The Sandlot are also on deck. However, not everyone has had the same vision for the space. Local alderman Tom Tunney pushed, with some success, for a handful of restrictions on the use of the Park, citing the well-being of the residents of the surrounding neighborhood. Ald. Tunney was able to establish rules about who could drink alcohol in the Park on game days, and when. Currently, only ticket holders will be allowed onto the plaza immediately before and after the game, and barriers and bike racks have been set up to control the crowds. This did not make the Cubs administration too happy. Kenney had other words for the city, which he felt could have provided more financial support for the project, as it is part of a larger $500 million renovation of the entire complex. “The mayor made clear the city could not give us the kind of financial support the White Sox got in rebuilding Comiskey Park or the Bears got renovating Soldier Field,” Kenney said. Despite the financial discussion, the Cubs were openly grateful to Mayor Rahm Emanuel, who was on hand at the ribbon cutting. While the city has not provided the tax and financial backing the team had hoped, it has provided support through the temporary and permanent closing of multiple streets surrounding the stadium. Exactly what the Park’s role will be in the greater Wrigleyville neighborhood may still be up for debate, but, for the Cubs, the new space is a chance to reach out and bring the community a little closer. And timing couldn’t be better: With the Cubs winning the last World Series and effectively having the best season in the stadium’s 103-year history, much of the city is already going Cubs crazy. Just in time for the beginning of the 2010 season, Major League Baseball has spiffed up and expanded its headquarters and the office of its commissioner at 245 Park Ave. Conducted by Butler Rogers Baskett Architects (BBB) and exhibit design firm C&G Partners, the redesign included the addition of a 24,000-square-foot conference center on a full new floor. Aside from bringing the HQ into the 21st century with up-to-date teleconferencing equipment, the designers went out of their way to make every surface in the place scream baseball. 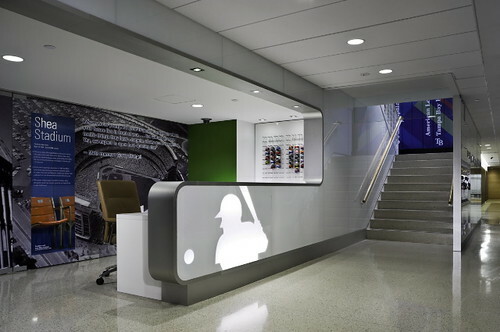 Base-like fabrics, baseball stitching in leather panels, ash wood conference tables, carpet and terrazzo flooring reminiscent of the grass, dirt, and chalk lines of the baseball diamond, all conspire to transport visitors straight to the ballpark. Even the procession through the space evokes the stadium experience: An angled hall leads from a compact elevator lobby to a solitary oversized door that opens onto a spacious reception area anchored with a backstoop-shaped module. Glass walls are etched with baseball statistics, seasonal displays exhibit selections from the Baseball Hall of Fame in Cooperstown, New York, video screens stream information from MLB's website, and baseball news flashes across LED tickers. There are baseball graphics and murals by C&G, mannequins adorned with American and National League uniforms, vinyl-padded panels like those on an outfield wall, a giant picture of Jackie Robinson stealing home in the first game of the 1955 World Series. 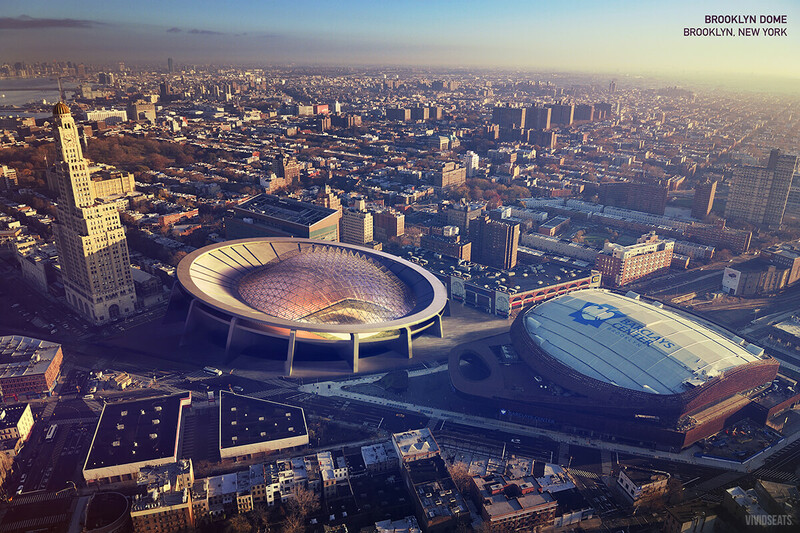 "The overall design pays tribute to the grit, spirit, and passionate tradition of America's favorite pastime within an environment of the highest aesthetic refinement," said Keith Helmetag, a partner at C&G. "We incorporated design details that were non-literal, that don't scream 'baseball' but contain subtle references that capture the playful nature of the sport," said Jeff Knol, BRB's project designer.